I am not taking time to edit these thoroughly so please forgive typos. This is a great video series and opportunity to learn more about Christianity from both historical and contemporary perspectives. 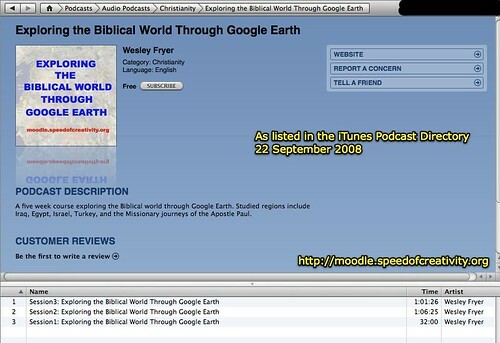 Exploring the Biblical World Through GE in iTunes! The new era of Internet broadcasting has dawned. How amazing I didn’t need to purchase a radio antenna or even purchase airtime on one to realize the dream of global content and and idea distribution. Do we realize the amazing implications of this?! This mashup site allows users to select a book of the Bible and the chapter, and then view in Google Maps (not Google Earth) the geographic references mentioned in that passage. BibleMap.org is a great resource for readily identifying and finding more information about locations mentioned throughout the Bible. 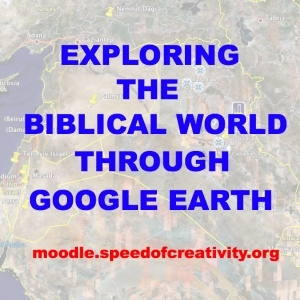 I have added audio recordings of my “Exploring the Biblical World Through Google Earth” classes as a podcast to our class Moodle website. So far we’ve had two classes, we’ll have three more in this particular Wednesday night series. The five weeks immediately following this class I’ll offer “Lifelong Learning via iTunes University,” which also has a Moodle course component hosted on the same server.